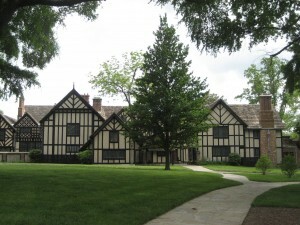 Early summer is the perfect time to visit Agecroft, a 15th-century English manor house brought to Richmond in the 1920s, stone by stone, brick by brick, timber by timber. Inside is a treasure trove of 15th-, 16h-, and 17th-century antiques that bring to life medieval English ways and fashions. Unfortunately I couldn’t take photographs of the interior, but its sites, www.agecrofthall.com and www.agecrofthall.org/newsletter are great resources. It is just such a house as this that antiques appraiser Sterling Glass finds mayhem and mischief afoot in her newest adventure, The Big Steal. (Algonquin Books, ISBN 13-978-1-56512-446-2) That house is named Wynderly and is set in Orange County, Virginia, just about an hour northwest of Richmond, and is, of course, fictitious. But evocative and romantic houses (think Biltmore, San Simeon, Stan Hewett, to name just a few) were all the fashion in the 1920s for those who could afford them.